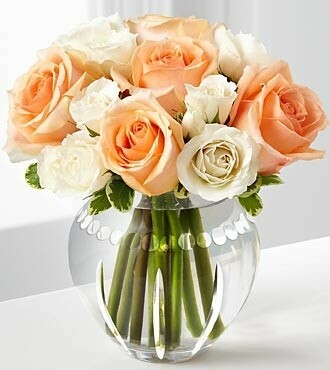 A creamy concoction of coral/peach roses and ivory lisianthus in a clear fish bowl vase. 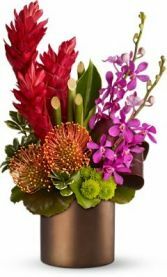 Energy through movement of fresh Hawaiian ginger, pin cushion protea, kermit chrysanthemums, and purple mokara orchids from Thailand. 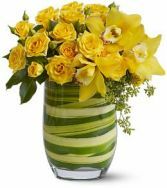 Sunny yellow sweetheart roses lend energy to vibrant yellow cymbidium orchids in a tropical leaf wrapped vase. 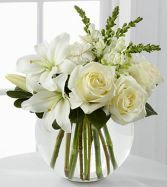 This striking display of pure white flowers will send your heartfelt expressions when words just aren't enough. Please visit our Events website at www.feteboutique.ca if you are looking to book a wedding consultation.